Concentrate Essential Oil Blend has a soft, clean scent with sweet, woodsy notes. Concentrate Essential Oil Blend’s Vetiver constituent helps focus concentration, reduce mental distractions, and sharpen awareness, which makes this blend a great choice to apply before school and during homework time. Click here for the GC/MS test results for your bottle of Concentrate Essential Oil Blend. We love it. Helps our sensory kid focus at school! We've been using 2 weeks and have seen a improvement in her.. We are excited to order more and try other products offered.. Using it for my granddaughter (6yr) to help her focus in class.. I received the concentrate oil a week ago. I ordered it for my daughter to help her focus more at school and home, it has helped her. In just the week we have been using it I have noticed a difference. I love this blend! It seems to have helped my easily distracted 7 year old focus in on his school work so much better. I’ve even used it at work and have seen a noticeable difference. I am a little disappointed that the bottle leaks a good deal. Other than that, we are highly satisfied and will definitely order again! Hello Austin, thank you for your feedback! It sounds like you received a damaged or defective product. We are a zero defects company and we consider this leakage unacceptable. If you could reach out to us we would love to make this situation right. Thanks! I have been putting this on my son before school. He says that it has been helping him stay focused at school. I heard from his teacher today that he got a 100 on his math quiz! He took his time and followed instructions. It works great will definitely be ordering more! I’m so pleased with you roll-on for concentration as it did help my 4 years old do school work and focus ! The only issues is. That I didn’t know that it leak which made me very sad ! I put it in my pocket book as a to go for my son only to find it leaked in my pocket book -:( other than that I’m very pleased with this product . We’ve only been using it for about a week, but it seems to be helping my 8 year old son at school. His teacher says she notices an improvement. He’s not so wiggly when she’s teaching at the board. And it smells good too! I bought this for my 9 year old daughter who is having trouble concentrating in school. Her teachers say they have noticed it has helped this past week. This was my first essentials oil buy. My 6 year old has been having problems at school when doing work so I decided to give this a try. I have only been using for about 2 weeks and it has seemed to help him out a lot. One day I forgot to apply and he ended up having a really bad day so I am pleased so far. Use this on my 5 year old and it is actually extremely effective! I got this because I was unable to focus at work and kept getting called into my manager's office because my work quantity as well as quality was really suffering. I am happy to report that Concentrate has really helped me, and now my coworker wants to get some too. And my boss is finally off my back! This was my second time ordering from RMO, and I am very impressed. Shipping both times was super fast and free, these are high-quality oils that smell and feel luxe, and the website is a breeze and a pleasure to navigate. I got this oil for myself and my husband. I wanted to use it for bible study and my husband goes to college. I had him use it for the first time and I left to go to the store while he studied with our 3 year old played. When I got back i asked him did the oil helped. He said he felt like it really did since he was able to concentrate on his studies and do a test even though our daughter was being loud playing. Will be buying more oils, as i am impressed! Great product, effective. Fast shipping. I use this on my 5 year old son daily before school. We feel it has helps quite a bit with his focus while at school! Helps my son to concentrate in school. We definitely notice a difference on the days he uses it vs not. Works great. Helps me stay focused. I originally purchased this for my son who has trouble staying focused. The plan was to use it when doing our lessons (we homeschool). It did help with school. The second benefit is for bedtime. My son struggles with falling asleep and staying asleep. We started using the sleepy time oil for bedtime but we also use this to help calm his mind and ready him for bedtime. I love this product! I am a homeschool mom of 2. I feel like it's already hard enough to keep my kids attention being that our home already has enough distraction(toys, dogs, tv, etc). This does wonders for my 4th grader but for my boy in kindergarten who simply would not and could not sit still longer than 5 minutes, this blend has been a game changer!!! He can now "concentrate" on what we are doing and seems to be able to sit a bit longer!! I'd recommend this oil! I have been using this on my 7 year old son the last 2 weeks. We homeschool and he has a hard time staying focused and concentrating. I used it a couple days in a row and was amazed how well he was doing, I thought no way the oil is that good, maybe he's just having a really good day. So the next day I didn't put it on him. He could not sit still or concentrate.l, I couldn't handle him. Or doing his school so I put the oil on him and 10 minutes later he had no problem getting it done! I told my husband and he said it was just a placebo effect but I told him our son had no clue why I put the oils on him. The second week I tested again not putting the oils on him and I saw him regress, not even 10 minutes after putting the oil on Him he was able to get his school done easily. I put it on him in the morning and after lunch if he still has school left to do. I love this product and I hope it sticks around. I bought this for my 5 year old son. He started out kindergarten well, but some time in October I started getting notes about his behavior. Usually one teacher or another would comment that if s/he were next to him, he did fine. But as soon as they left he would get distracted and get off task. It got to be a daily occurrence when he was at school. I figured essential oils were worth a try, and this was my first purchase from RMO. I first tried it on the back of his neck, his teacher said she saw some improvement. The next time he went to school I slathered it on the bottom of his feet. He had a great day! I've been putting it on the bottom of his feet, for school, ever since and have not received one note home! I'm so impressed! I just purchased this for my daughter to help her focus in school and while doing homework. Since she is currently on winter break, I haven't had a good opportunity to use it on her, so I brought it to work with me and I noticed a difference in my ability to stay on top of my work. I also noticed that it benefits productivity when cleaning up around the house. This was my first RMO purchase & I was beyond pleased! Shipping was super fast & the quality is awesome. I love the rollerball line - it's so easy to use and convenient for travel as well! My 5 year old son struggles with sitting still in kindergarten and concentrating on what he's suppose to be doing. 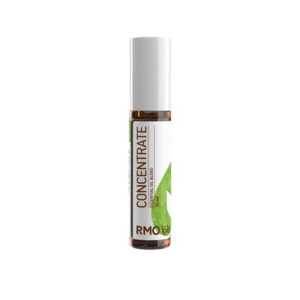 A colleague of mine suggested I try using the Concentrate essential oil from RMO on him. It smells good. The roll on applicator makes it easy to apply. I dont know how much it helps at school, because he still has bad days. However, we did lose it one day, and his teacher said she could tell a big difference. I have ordered more, and we will continue trying it. Shipping was fast. Thanks RMO! I homeschool my kids and they love putting this on before school each morning. I use some, too! I do feel it helps us all wake up and focus! I love my RMO's!! I use for staying healthy and for perfume making. I also bought the collection of fractionated oils for blending and am very happy with these. I love the roller balls for kids. Takes the worry of concentration out of the equation. I purchased the Concentrate roll-on for my 8 year old son who has Anxiety, Sensory Pricessing Disorder and ADHD. I specifically wanted the roll on so he could use it on himself and take it to school for use there. After trying it for a week I can say I am pleasantly surprised at its effect. First of all it smells great, not to overwhelming. Second, on days I forget to give it to my son I find he is very restless and jittery and often says he feels "off" but not for a particular reason. That is typical for him. On days he uses Concentrate, I see a lot less of that. Finally, my son reminds ME to grt his oil because he feels better when he uses it. I will definitely be purchasing this item again and again! PS my skeptical husband has been caught using a dab or two when he thinks no one's watching! My husband and I felt it really helped my active five year-old grandson calm down and focus. The smell is much better than using Vetiver by itself. I am going to purchase the adult version for myself. My daughter easily feels overwhelmed by a crowd. In gymnastics class, there is always more than one group of kids rotating around the gym with their respective coach. When I apply this rollerball to the back of her neck, she seems more able to enter the noisy gym without shrinking back. She also seems to be able to focus on what her own coach is saying. She loves the smell, and asks for it in other crowded contexts, too. Like going to the grocery store, church, and more. Haven't been able to confirm oil purity, but they seem to be good. I got this for my son. He didn't like diluted Attention Assist with coconut oil on him. I then made a shea butter cream that didn't win him over. He likes the roller ball. I just got it so I have yet to fully evaluate the effects. The oil is great, but I gave it three stars because it worked better for relaxation and sleep, instead of Concentration. Wish I could love this.. I bought this for my 10 year old who is ADHD. It doesn’t seem to do anything for him however, he loves the light scent of it. I think I will try attention assist for him to see if it has a better effect on helping him concentrate. The fragrance was very weak compared to other brand oils I have bought in the past. where is the best place to apply concentrate for maximum benefit? BEST ANSWER: The most common areas for topical application include rubbing the diluted oil on the back of the neck, behind the ear, on the wrist, the bottom of the feet or on the targeted area. I do not know, scientifically-speaking, but my son likes to have it on his wrists so that he can really smell it when he wants to. Also, he tends to put his hands near his face when he's feeling frustrated, and I think, in some ways, catching a whiff of the oil this helps remind him to calm down and concentrate/focus - while getting the benefits of the oils themselves through the skin. Again, this is purely anecdotal, and there may be others who have more scientific answers than this. This may sound odd but I put it on my boys temples and behind their ears. If I can tell they are really hyper before school I may put some in their neck as well. It works wonders. I put oil on my wrists which works great! It seems to be used mostly for children are there adults who Have Success With the oils.? My husband actually uses this and he works as an over the road truck driver. Keeps him calm and focused on the road. He also uses it when he gets migraines. The migraine blend helps but the concentrate actually halts the migraine within about 20 minutes. I bought it for my boys but I have used it. It seemed to help keep me from getting that mental fog mid day. All in all I felt like it helped keep me in track. The kids line is for kids. They have adult rollers too. Are the roller ball containers refillable? BEST ANSWER: They definitely are! You are more than welcome to clean them and reuse them. Thanks! If you're asking if the roller ball top insert can be removed, yes but I'd recommend doing so gently. You can nudge it out and then reinsert. What is difference between Attention Assist vs Concentrate? BEST ANSWER: Concentrate Essential Oil Blend is prepped for topical application on children 2 years +. Attention Assist is great to diffuse and should be diluted before applying topically. What is the dilution ratio for this blend? Do you recommend using jojoba or coconut oil? I have never used Concentrate. Attention Assist seems to help me stay on task. My son takes strattera 40mg and adderall 5mg can we also use the concentrate oil on him as well? Our daughter is 11 and has a lot of trouble staying focused at school and during homework time. I have never used essential oils before, but I am planning to give them a try in hopes they will help her. I am trying to choose between "Concentrate" and "Attention Assist". I am unsure how to prepare the Attention Assist, but I was concerned the Concentrate would not be as effective given she is above the recommended age range. Any suggestions? The Safety Kid's guideline is meant to guide parents in using essential oils in appropriate age groups. Kids can use specific essential oils depending on their age. If the child is over 10 years of age, they are able to use any oils we provide safe and with appropriate guidance. Concentrate is diluted at a 2% topical application rate which can be safely used on the skin. The oils are meant for similar purposes, however, it is all based on personal preference on which oils you prefer. What's the difference between this and the attention assist roller ? If I put immunity on my daughter's feet for school where's a good place to apply this in conjunction ? Thanks !! BEST ANSWER: Great question! Attention Assist is prepared for topical application on adults, meaning it is diluted at a 5% dilution rate. For topical application on children we recommend a 2% dilution rate. Because Concentrate is part of our Kids collection, it is pre-diluted at a 2% dilution rate and is prepared for topical application on kids. Lastly, Attention Assist is in a base of Jojoba Oil and Concentrate is in a base of Fractionated Coconut Oil. Other than the bottom of the feet, the most common places for topical application would be behind the ears, back of the neck, and the wrists. My son is 13, should I use concentrate or attention assist on him? How often can this formulation be applied during the school day (and still be safe)? The oil is safely diluted at a 2% dilution rate which can be applied topically at any time during the day. Does consentrate have vetiver in it? If so what is the percentage? BEST ANSWER: The Concentrate blend does contain Vetiver. The percentage of the essential oils used in our blends are proprietary information. My daughter struggles with focusing during schoolwork. Where do you find is the best place to apply this oil?